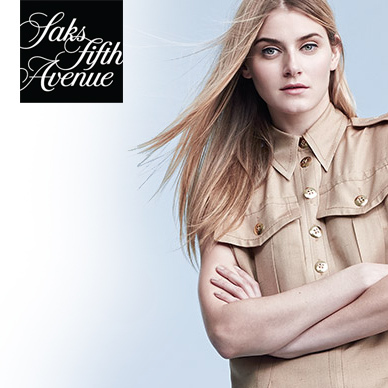 Saks Fifth Avenue Sale is now on with savings across fashion, footwear and accessories! One of the world's most exclusive department store chains, Saks Fifth Avenue houses some of the world's most luxurious brands. Since being founded in 1898, Saks has continually had access to the best brands within sectors ranging from designer clothes to jewellery and even housewares and beauty products. Brands will often house exclusive collections in Saks to maintain its attractive appeal. Celebrities often quote Saks as the place they like to shop, and with reason, as it is consistently offering the most high class, and fashionable items. Shop the Saks range with up to 75% off RRP today! Add Saks Fifth Avenue to your Favourites list and be the first to know every time they have a Sale on! 1st January 2018 - Saks Fifth Avenue New Years Day sales for 2018. 7th May 2018 - Saks Fifth Avenue Early May Bank Holiday sales for 2018, add to your diary now! July 2018 - Saks Fifth Avenue Summer 2018 sales, joining us? 23rd November 2018 - Saks Fifth Avenue Black Friday sales in 2018 start on Friday 24th November. Add products from Saks Fifth Avenue to your Love Sales list. Get the Love Sales button now! Saks Fifth Avenue January Sale is now on with savings across fashion, footwear and accessories! Saks Fifth Avenue Boxing day Sale is now on with savings across fashion, footwear and accessories! Saks Fifth Avenue Christmas Sale is now on with savings across fashion, footwear and accessories! Saks Fifth Avenue November 40% off Sale is now on with savings across fashion, footwear and accessories! Saks Fifth Avenue Cyber Monday Event is now on with savings across fashion, footwear and accessories!